Most commercial flat roofs in the past wouldn’t typically last as long or be quite as durable as sloped roofing systems, because sloped/pitched roofs shed rain and snow better. But, over the last few decades new and advanced materials have been developed for flat roofs. They’re very durable, energy efficient and compete with sloped roofs for length of lifespan. EPDM (Ethylene Propylene Diene Monomer), PVC (Polyvinyl Chloride), and TPO (Thermoplastic Olefin) are the main kinds of single-ply membranes. In today’s market, these three are the most requested materials used for both commercial and residential construction. Its critical to know that they’re NOT the same as far as quality and longevity go. Each has very different formulations, durability specifications and expense. 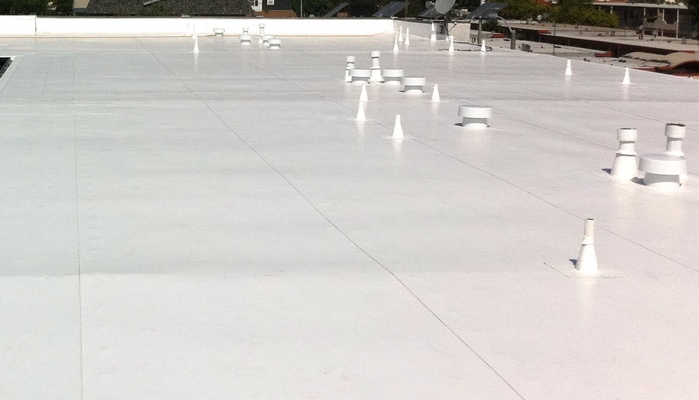 Single-ply is just one layer of membrane as the waterproofing and weather deflecting surface. All membranes range in width from 6 ft. to 18 ft. The most commonly used width is around 10 feet. The average thickness of the membrane ranges from 45 to 90 mil. Its usually recommended to install a membrane that’s at least 50 mil in thickness. In the single ply roofing market, there is a big discussion about using TPO versus PVC membranes, and serious arguments about which is more effective. PVC is now considered to be the more durable. Its specially created to remain solidly intact in a wide variety of severe weather elements (rain, snow, wind, sun, hot and cold temperature variations). Also, what makes PVC so solid is the fact that the top and bottom ply of the membrane have almost equal thickness. TPO, on the other hand, has limited durability, as there isn’t any consistent specifications with manufacturers, who are testing to make it more durable, and also less expensive than PVC. But, as with any product, when you try to lower price by lowering the quality of the materials you’ll end up with an inferior product. One thing that affects TPO’s strength is the top ply (weathering surface) of the membrane (which provides the durability) is actually thinner than the bottom ply. In most variations of the product the ratio is 40/60. Lastly, most TPO systems have inferior resistance to heat and solar overload. Built-up roofing materials are made using built-up layers of either tar-infused paper and liquid tar with gravel, asphalt, rolled asphalt, or modified bitumen. As the roofing system is installed, additional layers are added to increase its durability and lifespan, therefore the name “built-up”. All of these methods are becoming outdated by today’s modern construction standards. They’re hardly ever installed on large commercial properties anymore, but some residential homes are still using it, due to the low installation cost compared to other methods. You should remember that any kind of built-up material requires a more positive roof slope of at least 1/12 inches. 1. Spray Foam Insulation which is sprayed directly onto the roof deck and then coated with acrylic or urethane coating, and sometimes a layer of crushed stones or sand in addition to the coating. 2. Paint-on Roof Coatings are made for existing roofs and used to extend their service life by 10 or more years. They are usually applied on top of single ply, modified or low slope metal roofs. 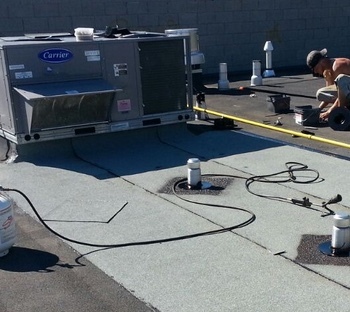 Here at Armadillo Roofing & Exteriors, we provide commercial flat roof repair, commercial flat roof installation and residential flat roof installation services to Killeen, Texas and all the surrounding area communities. We’ve been in business since 2003 and have plenty of experience in all commercial roofing applications. 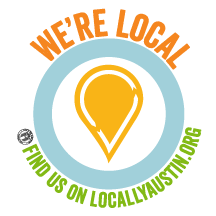 When you need advice on repair or installation of your commercial flat roof, don’t hesitate to give us a call at (512) 333-7663.